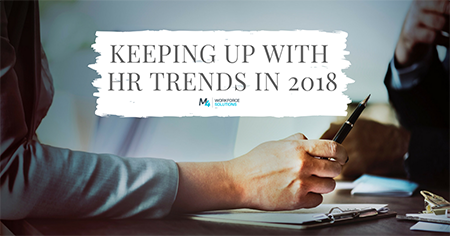 While it is nearly halfway through 2018, it is a great time to reevaluate the current trends in HR and how your company has adjusted so far. Most of the trends for this year revolve around the employee and their work experience, expect to start making some changes if your company has not been following HR trends. While change can be hard for a company initially, there are many benefits to keeping up with current trends in the HR, improving the workplace as a whole. As you interview candidates this year, it may feel as if they are interviewing you and your company instead of the other way around. That is because they are. Employer branding is getting more important every year. Candidates are seeking company cultures that make them excited about their work and fit their personality and lifestyle. If your company needs a brand, not just for their products or services, but as an employer. Start creating programs for your employees, reward them for attendance, engagement, maintaining a healthy lifestyle, etc. Human Resources has the opportunity to play a direct role in the employee experience, helping to build strong relationships with employees and improving employee recruitment and retention. Chatbots are the top tech trend of 2018 and they are perfectly suited for Human Resources. According to chatbot builders Ubisend, these chatbots can manage up to 83% of day-to-day tasks for HR employees. Investing in this communication technology will save both time and resources. HR staff spend time answering the same questions over and over, when chatbots can be programmed to help manage the simple, but frequently asked questions. Having these bots available to answer basic questions will help minimize frustrations and miscommunication, improving employee onboarding and retention. Studies are also showing that these bots help to remove bias in the workplace, which is a current issue in the hiring process. Companies can not afford to resist this digital transformation. By now we know that millennials are currently the largest group of any generation in the workforce and they are quickly making their way up. One of their top priorities when seeking a new job or career is a flexible work schedule and the opportunity for a healthy work-life balance. The Society for Human Resource Management (SHRM) reports that companies offering a flexible work schedule for employees see improved retention, recruitment, and overall employee morale. Employees and candidates are also seeking remote opportunities, meaning the “gig economy” is on the rise. While initially this may change the hiring process, there are benefits to these changes such as lower office expenses and the ability to hire out for positions that do not require a full-time employee. Has your company made an effort to become more transparent over the last year or two? Problematic workplace cultures have been a major topic of discussion in recent years, sometimes ruining the reputation of a company. Being more transparent will set a much clearer culture within the company. Start with leadership and make them accessible, then be sure your company is maintaining an honest presence online and showing some of its personality on social media. This will improve employee retention, attract both consumers and future employees, and company growth.